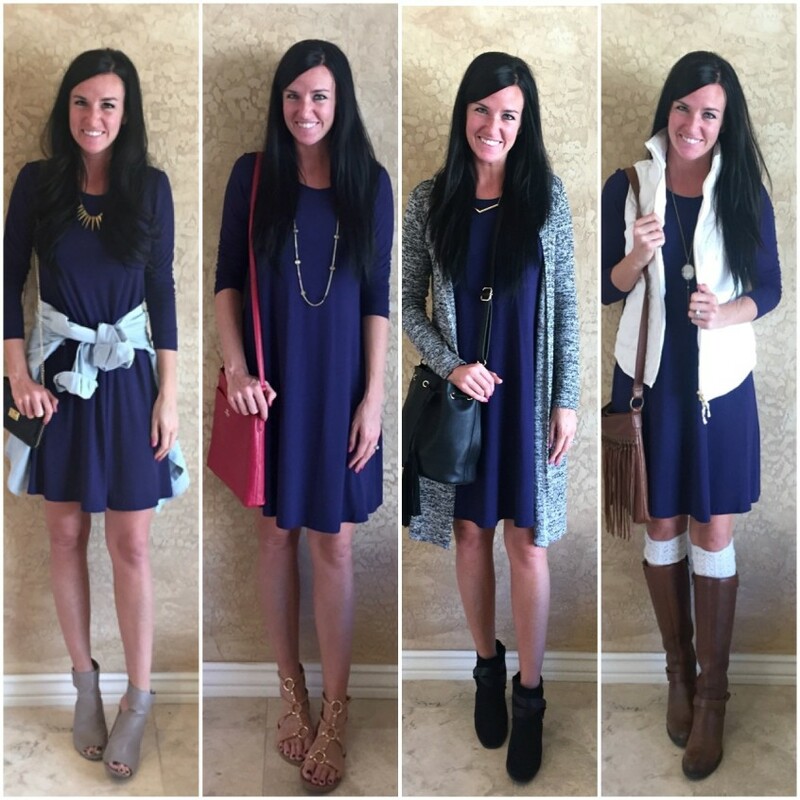 You may have noticed (especially if you follow along on Instagram) that I have had so much fun layering with dresses! I guess in Arizona, our temperatures allow us to do that pretty easily during our “cool” months. I wanted to share a recent gem I found – a navy swing dress! Old Navy sold the most beautiful burgundy dress in the fall season (see that post here), and unfortunately I was too late to order it in more than one color. Since the day it sold out, I have been on the hunt for a dress just like it. And friends, my search is up! This dress is from SheIn Clothing, and is long enough for work, and the material is thick and flattering. It comes in this beautiful blue color as well as grey, burgundy, and dark green. Today I’m styling my swing dress 4 ways – taking it from winter to summer! And, I included a style board at the end to help inspire even more looks with this beautiful dress! *This post is created in collaboration with She In Clothing. All opinions are my own. That dress fits you beautifully! I love it! Shein.com looks like a really neat site. How long does it take to ship things?